Here are just some of the things we have got up to in the past to help raise funds for our appeal. 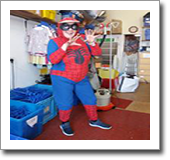 July 2018 saw us dressing up as superheroes which gave the staff and volunteers a chance for some fun whilst attempting to boost our funds. 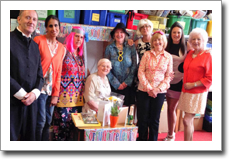 Our special fun day this year was 'Rock 'n Roll' and we all had a great time. 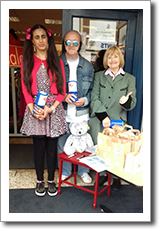 The outfits were wonderful and it was a rewarding day, raising much needed funds as usual. 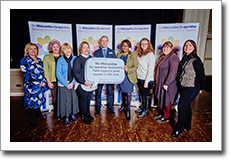 In 2016, Midcounties Co-operative invited us to celebrate with all the organisations they have helped with fund-raising events. Their hard work and commitment to the community is greatly appreciated. 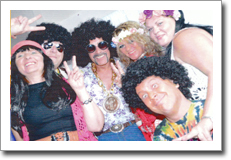 Everyone enjoyed dressing up in 60's fashion with all the glamour and fun of this exciting time. January 2016 - Cabaret Evening. Cabaret Evening Fundraiser held on behalf of our appeal. August 2015 - Hoe-Down-Funday 20th Anniversary Celebration. 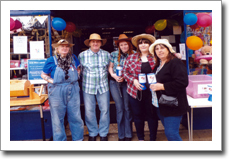 To celebrate 20 years since the start of the appeal, everyone dressed up as cowboys and cowgirls, wearing checked shirts, denims and hats. A great day with lots of activities on the go. August 2015 - 1970's Evening. 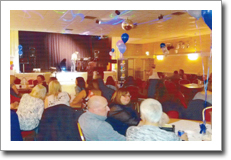 Jane Hanock organised a 1970's Evening at Pennfields WMC which was a big success. July 2015 - 'The Wizard of Oz' Performing Arts Presentation. The children of Fallings Park Primary School raised £207.19 through their brilliant performance of 'The Wizard of Oz', a Performing Arts presentation at the Arena Theatre, Wolverhampton. April 2013 - Fun Day. 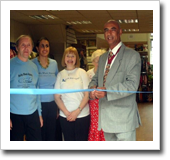 To celebrate the refurbishment of our new shop front. 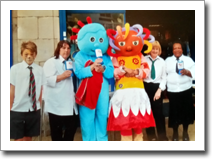 August 2014 - Back to School Fun Day. Raised £113.80 through refreshments, lucky dip and face painting. March 2014 - Bridgnorth Ukulele Band & Strummers. Raised £440.93. Thanks to Tesco for their support and donation towards refreshments. July 2012 - Bollywood Day. Raised £150.60 towards our appeal. 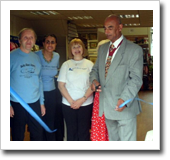 May 2012 - Re-fit of Shop Celebrations. 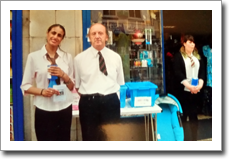 Volunteers held a raffle which raised £283.00. September 2011 - Charity Head Shave. Over £300 was raised in sponsors thanks to one brave volunteer who agreed to have her hair shaved off. August 2011 - Poker & Golf Day. Central Taxi's held a Golf Day at the Wergs Golf Club, Keepers Lane, raising £1,100.00. 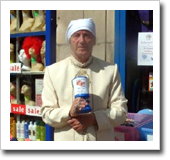 March 2011 - Charity Pram Push. 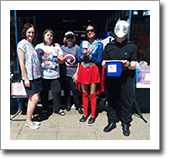 Volunteers from The Baby Blues team held a charity 'Pram Push' which involved one of the team dressing as a baby whilst the rest pushed her round in a pram raising another £75.45. August 2010 - Pirates Day. 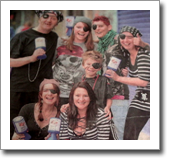 Baby Blues Appeal staff dressed up as Pirates for the day to help raise funds for the charity. 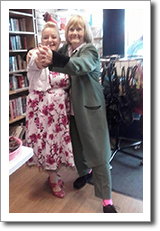 Volunteers aged 21-60 gaily wore eye patches and bandanas and spread a little cheer throughout a quiet time in the shop making for quite an enjoyable day. A total of £123.11p was raised towards our appeal. 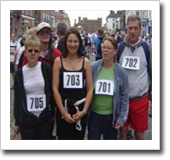 May 2010 - Bridgnorth Sponsored Walk. Dedicated members of the Baby Blues team took part in the annual 22 mile Bridgnorth Sponsored Walk raising £500.00 towards our appeal. The team completed the course in 6 hours and 50 minutes. October 2009 - Fashion Show. 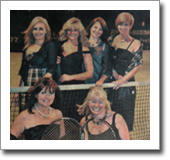 Held at Wolverhampton Lawn Tennis & Squash Club. 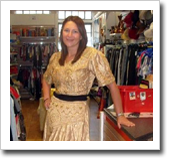 Organised by Sue Horsefield, owner of Lily Of Bridgnorth clothes shop. Attended by approximately 120 women. Glittering gowns and smart suits trod the catwalk, and with a 2 course meal and raffle, a really enjoyable evening ensued, raising £765.00 for our appeal. December 2007 - Fashion Show. Held at The Saddlers Supporters Club, Walsall. 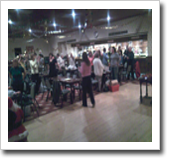 A decent turn out, and an enjoyable evening was had by all. The sale of some of the garments on show, along with a raffle helped us to raise a little under £500.00 towards The Baby Blues Appeal. November 2007 - Lipstick & Lingerie Evening. Held at The Saddlers Supporters Club, Walsall. A big thank you to everyone who made it along, and a special thank you goes out to Claire Emmerson, Jo Pearson, and Karen Ellis. The funds raised made for a great boost to our appeal.